Smart Mom Jewelry is offering our readers a giveaway of a Teething Bling Gift Set, a value of $36. The Teething Bling Gift Set is an awesome three-piece set including their signature 2×2-inch donut-shaped teething pendant and two coordinating teething bangles. The Teething Bling Gift Set consists of the Signature Teething Bling Pendant and two Teething Bangles. 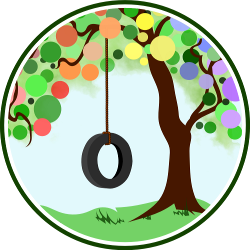 The pendant is a 2×2-inch donut-shaped pendant that hangs on a black silky cord with a breakaway clasp. The bangles coordinate with the pendant and are one-size-fits-all. Both the bangles and pendant are made of food-safe, phthalate-free, federally approved silicone. 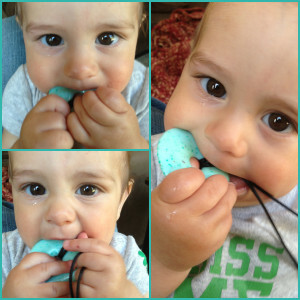 Teething Bling is a modern fashionable way to entertain and soothe your teething baby. My teething babe loves it, and so does his mama! I have been loving the splash of color and style it adds to my wardrobe while also giving me a way to entertain and engage with my baby while out and about. When I received the set, I really loved the Jade color of the pendant and matching bangle. The coordinating brown bangle I received is sort of a rusty brown color. The Jade especially goes with so many of the colors I wear so it is very versatile. And the best part? It is a really fun play thing for my little guy while nursing and being worn or carried. It is also the perfect distraction for diaper changes and for strapping him in his car seat, two things he normally doesn’t care much for. Aside from the fact that the pendant and bangles look great and are fun, striking pieces of jewelry, they are also a very practical tool for me! I’m a nursing mom and spend a lot of time with a curious nursing babe in my arms. My little guy is 8 months and LOVES to grab mommy’s hair and clothes and then PULL! When I’m wearing my Teething Bling, he will grab the silky black cord to play with instead. Win! Even if he does manage to lock onto strands of my hair, I can easily place the pendant in his hand and he is happy as can be. The pendant is also fantastic for babywearing. He can play and chew on the pendant while I go about my day, whether enjoying the park or children’s museum with my 4-year-old or vacuuming the floors. And the bangle is what has really surprised me. To be honest, when I saw it, it seemed like it would be too big and would be more in the way when I wore it. But it turns out that it is the absolute perfect thing to be able to just pull off my arm and give to my baby to play with. I love to have it on and slip off during diaper changes (since he is SO not into lying still these days), and it is a great little fun thing to hand to him when he is cranky about being set in his car seat. I don’t have to dig in my bag for a toy because it is easily accessible right on my arm! And no one is the wiser because it is just a funky bracelet to anyone else. The actual pieces themselves are flexible and sort of rubbery feeling. They are fun to play with and manipulate. And I’m sure they feel oh-so-nice on those sore gums. At least it seems that way by the way my son loves to chew on them! I’m really thrilled with this product and recommend them to moms of young babies! I will still wear mine past the baby years, too! You can purchase your own Teething Bling Gift Set at Smart Mom Jewelry and at Amazon. The Jade Gift Set I reviewed retails for $34, and the Design Your Own set retails for $36. 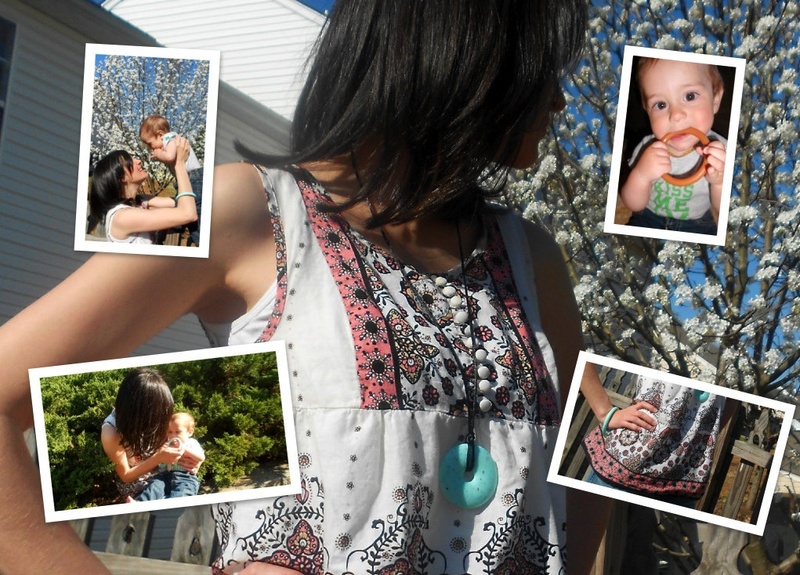 Smart Mom Jewelry is offering a discount to NPN readers! Use code “S-NPN” for a 20% discount until April 20, 2013! For your own chance to win a Teething Bling Gift Set from Smart Mom Jewelry, enter by leaving a comment and using our Rafflecopter system below. The winner will receive a Design Your Own Teething Bling Gift Set valued at $36. Contest is open WORLDWIDE. MANDATORY ENTRY: Visit Smart Mom Jewelry and tell us another item you like! You must enter your name and email address in the Rafflecopter entry system for your entry to count, after leaving a comment on this blog post. Contest closes April 20, 2013 at 11:59 p.m. Eastern Time. Julia blogs at A Little Bit of All of It about what she is passionate about: cloth diapering, breastfeeding (past infancy), bedsharing/cosleeping, baby-led solids, natural childbirth, attachment parenting, natural living, Christianity, miscarriage awareness and babywearing. She is mom to a 4-year-old daughter and an infant son. I learned about the breakaway clasp and think it is a great feature. My daughter and I will enjoy the teething bling set. I like all of the sets and pendants available and don’t really have a preference. 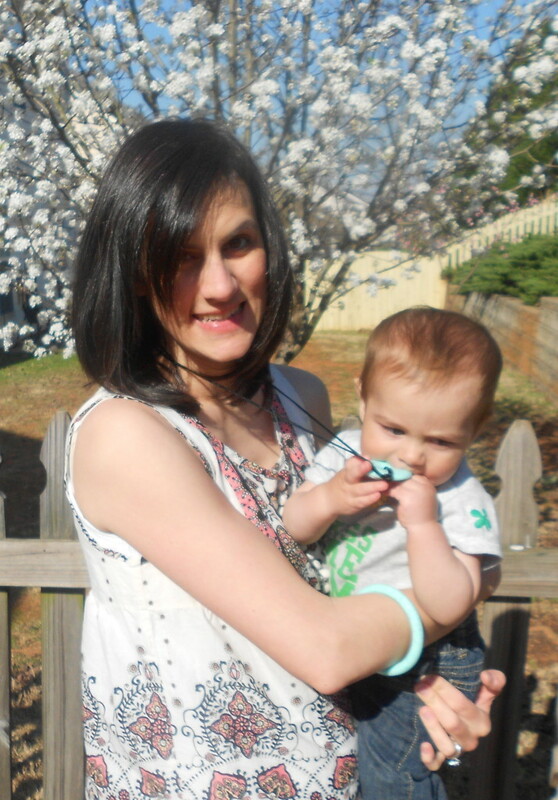 I did enjoy learning more about the moms who created Teething Bling and the short bit about it on the Doctors show. I learned their product is FDA-approved material and their pendants and bangles look great on the adults. They are safe for babies to handle and chew. I love that they make a scented bangle! I learned they are BPA (and lots of other bad things) free. I learned that they make Babe Magnets. Ties with squeakers and things. So very cute. How pretty! My baby girl and I would love this set! I love that the necklaces ar made of FDA approved material! I learned that the owner started this business after his sister in law passed away suddenly, and she had been an inspiration to her to open her own business. hubby’s niece is going to have a new baby, so this would make a wonderful gift. they are recommended by the doctors! and tory spelling has one!